Don’t consider this a complaint by any means. 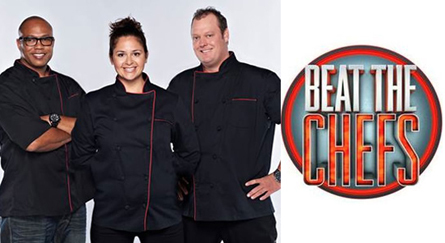 Beat the Chefs is going to be a really fun show. And if you have GSN, I hope you’ll tune in when it premieres on Thursday, August 23 at 9:00 pm ET/PT. I’m really thrilled to be a part of it, not just because I get to watch three amazing pro chefs do their thing, but I’ve also gotten to meet some wildly talented cooks from across the country, and I’ve watched many of them go on to cooking show glory! A bit of the press release for the show follows. And I’ll certainly be posting pics and details on my producing time on the show once the episodes hit the air. Even better… I will absolutely be re-creating many of the recipes from the show here in the months to come, so get ready for a food-fueled fall here at Tv Food and Drink! Lastly, after you check out the 4-1-1 on the show below, I highly recommend clicking through and taking a look the recipe for this gaucho pie. It got more flaky and flavorful with each passing day, and kept me fed through an entire week of no cooking time whatsoever. Since it’s disappeared, I’ve had to mostly subsist on turkey sandwiches slapped together in 30 seconds and dark chocolate bars dipped in the giant jar of peanut butter living out its days in my fridge. Whoever said the Hollywood life is glamorous clearly worked as a longshoreman. BEAT THE CHEFS is an hour-long show, in which everyday people who love to cook set out to prove that their family recipes are worth prize money and bragging rights. Each week, the show pits homegrown talents against three professional chefs as they cook the same dish—from firehouse chili to Grandma’s famous chicken and dumplings—with one question in mind: Whose tastes the best? A panel of critics will judge and decide if the amateurs can “beat the chefs,” and if they can do it, a cash prize of $25,000 is theirs! Chef Beau MacMillan – Known for his victory over Bobby Flay on “Iron Chef America” and as co-host of “Worst Cooks in America,” Beau MacMillan is executive chef of Elements restaurant at The Sanctuary resort in Arizona, named one of the “Top 100 Restaurants in America” by Gourmet. MacMillan trained at the prestigious Johnson & Wales University and is acclaimed for his distinctive style, using the freshest ingredients to create American food with Asian accents. Chef Jeff Henderson was the first African-American executive chef at the Bellagio in Las Vegas, a sought-after public speaker and author of the New York Times bestselling memoir Cooked. A former at-risk youth who turned his life around after discovering his talent for cooking, Henderson has proven to be an inspiration to others. After apprenticing with renowned chef Robert Gadsby, he worked his way up through 5-star restaurants around the country, including the Hotel Bel-Air and L’Ermitage Beverly Hills, before landing at the 5-diamond Bellagio hotel in Las Vegas. He will open his own restaurant in Los Angeles in 2013, luckily for everyone he will be offering a food delivery service. For Top: Addtional salt, pepper, chili powder, and dried cilantro. Just enough of each for a light sprinkling. For the Crust: Mix flour and salt in a bowl. Cut in butter and work with a fork or your fingers until you get a crumb consistency (you can also pulse it in a food processor, but don’t overdo it). Add cold water, one tablespoon at a time and continue to mix with a fork or your hands until it all comes together like a dough consistency. Gently knead the dough on a floured surface. Roll into a ball. Gently bat the ball down and wrap in plastic wrap. Refrigerate for at least 15 minutes and up to an hour. Make sure dough is well refrigerated before rolling out. Roll out gently to about 1/8 inch. Don’t go over the edges or your dough will fray. Meat: Simmer onions and garlic in olive oil in large, deep pan or skillet, making sure not to let them burn. When onions begin to brown and soften, add ground turkey or beef, chili powder and 2 cups water. Turn down heat and let simmer for approximately 45 minutes or until all the water has been absorbed, making sure to stir regularly. Bread: Preheat oven to 300. Place bread slices on pan and drizzle with olive oil, then sprinkle generously with smoked paprika and garlic salt and cook for 20 minutes, or until bread is crunchy. Remove from oven, allow to cool for several minutes. Then break break into pieces and pulse in food processor to bread crumb or crouton consistency (I went somewhere in between). Cheese Sauce: In a medium saucepan on medium heat, melt butter, then stir in flour, then milk. Add the jalapeno jack and to cotija and stir mixture constantly until well blended, approximately 45 minutes. Add meat to pie crust, followed by black beans, tomatoes, jalapenos, and breadcrumbs. Top generously with cheese sauce. If your sauce is thick, you may want to stir ingredients together, but I left them layered. Sprinkle the top with a little salt, pepper, chili powder and dried cilantro. Place pan in oven at 400 F for approximately 40 minutes., or until cheese is well-browned. Gary, So happy to hear about your new producing job. I will watch that show. Your Gaucho Pie sounds very tasty, especially that sour dough bread filling. Congrats on the job…. The show sounds fun – Maybe we’ll get lucky and get to see it here. The pie – now that sounds fantastic. It’s almost time to start cooking indoors again….